Celviano Grand Hybrid reproduces even subtle nuances of the world’s most respected pianos. Three pianos that originate in Berlin, Hamburg and Vienna were chosen for this project. 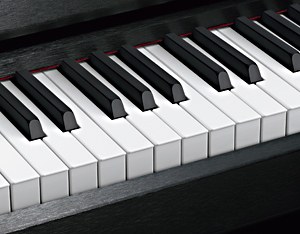 Casio has painstakingly researched and analyzed the unique characteristics of each piano. Celviano Grand Hybrid delivers brilliant sound of these pianos reproduced with Casio's advanced technology. It will provide the experience of owning three of the finest pianos on earth. Berlin Grand - A Balanced elegant sound. Ideal for playing impressionistic music. Notable for its clear, ringing tone acros the entire range. Hamburg Grand - A brilliant, rich sound. Loved by pianists for its wide range of expression. Well suited for various playing styles and genres. Vienna Grand - Noted for its impressive low range. Great for both soft and vigorous playing with its warm tone. An ideal instrument for music from the classical period. The Berlin Grand sound was developed in collaboration with C. Bechstein. Casio sought a clear, balanced and elegant sound for the Celviano Grand Hybrid piano. D282, C. Bechstein;s ultimate masterpiece, is the model Casio intensively studied to achieve the goal. Mr. Albrecht, Service Director and Master Piano Make at C. Bechstein, visited Casio R&D to supervise the sound development process throughout the final stages of production. Since Carl Bechstein founded the Pianoforte production facility in Berlin in 1853, the name C. Bechstein has stood for the highest class of upright and grand pianos. 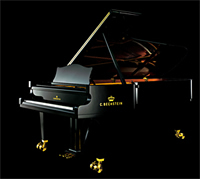 C. Bechstein is still recognised as one of the world's leading piano manufacturers. The Celviano Grand Hybrid incorporates the AiR Grand Sound Source, a newly developed system using Casio’s state-of-the-art sound technologies. Multi-dimensional Morphing delivers smooth changes between soft and strong playing. 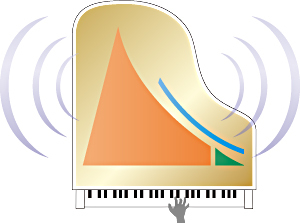 Acoustic Simulator reproduces the characteristics of sounds produced by acoustic grand pianos. 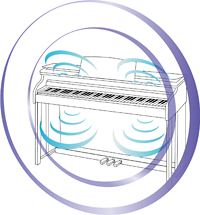 The authenticity generated by the AiR Grand Sound Source ensures a pure piano experience. On an acoustic grand piano, the volume and quality of sound changes from the time the keys are struck until they fade away. 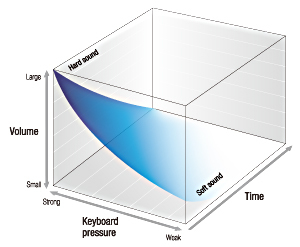 Casio's Multi-dimensional Morphing technology enables natural, smooth transitions in sound volume and tone based on the power of the keystroke. This technology contributes to more expressive performances. Casio has developed a new dedicated speaker system for the Celviano Grand Hybrid that reproduces the characteristics of sound emanating upwards and downwards just like on an acoustic grand piano. The four-channel audio system incorporates six speakers, carefully positioned in a structural design that releases sound outward from the interior of the body. 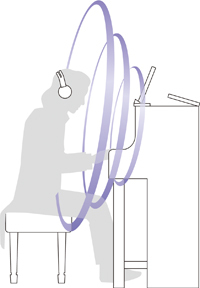 The system delivers the same sound field experience a player would enjoy while playing an acoustic grand piano. For an authentic piano touch, Casio has developed a new keyboard system called the “Natural Grand Hammer Action Keyboard”. This keyboard system features full-length wooden keys as well as hammers that follow the same path of motion as in a concert grand piano. Celviano Grand Hybrid features keys that are manufactured using exactly the same materials as an acoustic grand piano. Careful attention is paid not only to finish of the surfaces of the keys but also to the quality of the wood employed for the key beds. This combination of an outstanding action mechanism and superior-quality key materials further enhances the sensation of playing an acoustic grand piano. 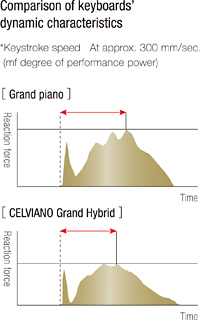 The core of Celviano Grand Hybrid’s keyboard performance is created by Casio's proprietary action mechanism. This mechanism includes a hammer movement modeled from a grand piano and three sensors, which accurately capture a performer's expression from the keys. 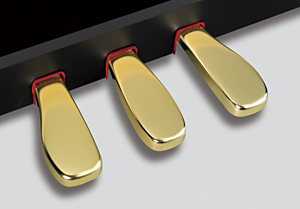 Since there are no physical strings, Casio's action is able to exceed the performance characteristics of a grand piano, providing superior playability that enables pianists to perform such actions as trills and repetitive notes with ease. Available only on the GP-500BP, this feature provides the most suitable sound environment to the music performers select to play. The Scene can be created by various combinations of tones, effects and reverberation levels. 15 different Scenes were designed as preset settings according to such themes as composer, musical genre and venue. Users can also customize Scenes and register up to ten of favorite settings. Celviano Grand Hybrid pianos have the ability to record performances directly to USB flash drive as stereo audio files (44.1 kHz, stereo .WAV format). Recordings can be stored or played back on a computer or transferred to CDs or other media. The piano’s built-in full playback function permits use of such features as pause, fast-forward, rewind and A-B segment repeat. UPDATED REVIEW - December 7, 2016 - New Casio GP500, GP400, GP300 Celviano Grand Hybird Digital Pianos - Recommended - I try to play every new digital piano that comes out on the market regardless of whether I already like that brand or not. There are some brands known for poorly designed digital pianos, others are known for cheap price digital pianos, and still other brands are known for being pro quality instruments that top pianists, music teachers, and other advanced players (like me) enjoy playing. So when it came to trying out and playing the new Casio Grand Hybrid series, especially the GP500BP with a retail price of $5999US (the BP stands for polished ebony), I was very skeptical that it really could be a good piano, and in reality I thought there was no way the GP series, in particular the GP500, could be taken seriously, especially at its $5999US price. Casio? $5999? I figured there is just no way those two things could possibly work together, especially given the huge competition in quality digital pianos from big well known names like Kawai, Roland, and Yamaha The name Casio has had a reputation for producing low priced but high quality consumer digital pianos as opposed to the much higher price Grand Hybrid pro series pianos. I like the consumer Casio piano products very much such as Privia and the lower price Celviano pianos and have done many reviews on those models under $2000 and they're a leader in that price range. But a Casio well over $3000?...and upwards to $6000?...there is just no way I thought...but wow, was I ever wrong. The new Grand Hybrid GP500, GP400, and GP300 are called "Hybrid" for mainly one reason...the key/hammer action. These days it seems as if all the major digital piano companies want to do whatever it takes in getting as close as possible to reproducing a real acoustic "grand" piano. So the GP series key action and piano sound chip is Casio's way of doing this, especially in replicating the touch action of a real grand piano. The question is...did they do it? Actually, I believe they did a remarkable job and the result is a fairly life-like key movement and weight unlike other digital piano brands, but it was not Casio who designed and built this Grand Hybrid key actions, it was the C. Bechstein grand piano company in Berlin, Germany. The C. Bechstein piano factory was founded in October of 1853 by Carl Bechstein in Berlin, Germany. Carl Bechstein wanted to manufacture an acoustic piano able to withstand the great demands put on the instrument by the virtuosos of the time, such as Franz Liszt. List was a phenomenal pianist and was very hard on pianos (he played like a monster) when it came to key action. In 1857, Hans von Bülow (Liszt's son-in-law) gave the first public performance on a Bechstein grand piano by performing Liszt's Piano Sonata in B minor in Berlin. By 1870, with endorsements from Franz Liszt and Hans von Bülow, Bechstein pianos had become the norm in many concert halls and private mansions. By that time three piano makers, all of which were founded in 1853, became established as the industry leaders across the world and they were Bechstein, Blüthner and Steinway & Sons. So the Bechstein brand was in very good company:). In 1881 Bechstein began supplying pianos to Queen Victoria and a gilded art-case piano was delivered to Buckingham Palace followed by several more Bechstein pianos to Windsor Castle and other royal residences. By January 1886 they were among the piano manufacturers holding was called "a Royal Warrant" as a supplier to the Queen. Several British embassies across the world acquired Bechstein pianos and they are still popular across the world today and used by professional pianists in concert. However, that brand is not as well known in America as they are in Europe and other parts of the world. What this all means is that the wood key action movement in the Casio Grand Hybrid pianos is directly from the Bechstein piano company and built for the new Casio GP piano series and the keys themselves are authentic full size grand piano keys made from real sprucewood from individual spruce trees in Austria (wow, that's pretty cool!). From what I have learned, the natural wood is precision cut and aged slowly over the time so that the keys in the key action can remain solid, aligned, and playable over years of practice and performance. Attached to the wood key action inside these Grand Hybrid models is a moving hammer mechanism designed to imitate real hammers in an acoustic grand piano. This moving hammer mechanism is made from resin and synthetic compounds, etc that can withstand weather and humidity changes so that the hammers will last almost indefinitely without the need for adjustment or maintenance as you would otherwise have in a real acoustic piano. When the hammers move as you are pressing a key, you can actually feel the weight of those keys under your fingers and direct connection of the moving hammer mechanism inside the piano to the keys which gives the player a feeling of natural expression and being directly connected to the music in a way that digital pianos without moving full length hammers cannot really do. The hammers in the Grand Hybrid pianos don't actually strike any strings in the piano because there are no strings...and that's one of the positive points of a digital piano...no strings to tune and maintain. 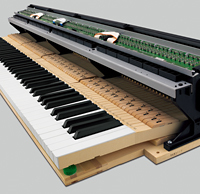 As a reference and comparison, the only other top name pianos with actual moving piano hammers in a digital piano is the Yamaha Avant Grand series of digital pianos including the NU1, N1, N2, and N3. 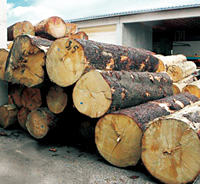 However, these pianos all use wood hammers, wood hammer shanks, and organic connective parts which are very good and just like an acoustic piano but will likely require more maintenance over time. The Yamaha NU1 (left pic - see-through front is for display purposes only) upright style piano sells for approximately $5000US at local store discount price and it has an upright console hammer key action but not a grand piano key action, and there is a very big difference between the two types. Beyond that, the NU1 has very few sounds and very few digital options and features so it's a very, basic digital piano in that way, although the cabinet is attractive in its polished ebony finish. The higher priced Yamaha N1 ($10,000US retail price) has a grand piano style action with all wood parts, but would likely require more maintenance over time as I mentioned earlier. The Yamaha N1 AvantGrand is an exceptionally nice digital piano, but even at discount price it sells for approx $8000US in Yamaha piano stores and the functionality and features are also very basic, The N2 and N3 go up in price quite a bit from the N1 and all have the same key actions as the N1 and pretty much the same basic features with a few exceptions. So when it comes to a key action mechanism in a digital piano, this new Casio Celviano Grand Hybrid GP500 (above left pic) in my opinion is years ahead of the lower priced Yamaha upright NU1 and very competitive to the higher priced Yamaha Avant Grand N1, N2, and N3 pianos, especially when it comes to all of the additional digital features and user display screen. The GP500, 400, and 300 have the industry standard 256-note polyphony processing power which is important in helping to give the player enough power to play more complex pieces of music without the loss of notes or damper sustain. As far as piano sound authenticity goes, all of the major digital piano companies would claim to have the best piano sound in their digital pianos and certainly Casio is no exception. What else would you expect them to say?! Casio wants you to believe they have the best piano sound found in these new hybrid digital pianos and overall I believe they have done a very good job and I was impressed. Casio has developed a new proprietary piano sound chip and electronics key sensing system not found in some of the other digital pianos and I thought these new acoustic piano sound samples to be very impressive in the GP series, especially the GP500. All of the digital piano companies use fancy words and phrases to describe how they get their piano sound along with the natural organic nuances they try to capture from real acoustic grand pianos to enhance the piano sound of their digital pianos. I won't bore you with all the terminology except to say that Casio records/samples 3 distinct well known European acoustic grand pianos which includes the Bechstein (Berlin) German Concert Grand, the Steinway (Hamburg) German Concert Grand, and the Bosendorfer (Vienna) Viennese Concert Grand. These three famous piano brands are the standard by which all other acoustic and digital piano companies try to emulate. Since the Casio GP series is designed in cooperation with the Bechstein piano company of Germany, it is easy to understand why the three main piano sounds in the GP series are so good. I found each piano sound sample to be unique with their own qualities of tone and dynamic range, but yet they were all enjoyable to play. What did impress me most about the piano sounds were their dynamic range of tone and the ability to really express yourself across all tonal ranges depending on your touch and finger movement. The Viennese Bosendorfer sound was also impressive to me and much more natural and realistic than the Bosendorfer sound sample offered on the new Yamaha Clavinova CLP models. With 256-note polyphony processing power along with good pedal sustain and dynamic expression, even advanced classical music can be played well including the layering of two instrument sounds together. Pedaling is always important to the piano playing experience and the Grand Hybrids will likely not disappoint you since it is done the traditional way with damper pedal including continuous detection pedaling along with adjustable half-damper control, sostenuto pedal, and soft pedal. The pedals seem to move naturally and they have a type of grand feel movement to the pedals unlike some other digital pianos I have played that have lightweight movement or no half-damper pedal control. Casio also added pedal resonance and damper noise to simulate what real acoustic pianos do when using the damper pedal for sustaining the piano tones. So the pedaling portion of this model is convincing, at least it is to me and I played it quite a bit. As far as the operating system goes, Casio incorporated a side panel control unit with LCD display which is very similar to what Kawai and Yamaha are currently using in their digital pianos. Although this is a simple and elegant design created to reduce the "digital look" of the buttons and controls of the piano and make it more minimalistic, I would prefer an attached lid or cover on that panel so you wouldn't see it at all when the piano is not in use or you just don't want to change controls while playing and don't want to see the panel. Kawai offers this design on its top of the line digital piano called the CS11, but that model retails for more than $8000. The Samick piano company offers a beautiful upright style digital piano called the NEO with a side control panel and it has an attached cover that closes up over the buttons and display screen, and that piano is less than $4500US retail price. Regardless, the control panel still looks good, is minimal in design, and I found that using the controls was fairly easy to do (although there is still a small learning curve) and the display screen was, overall, easy to read and buttons were easy to use. However, in additional to the LCD control panel, I would also like an iPad/Android app to connect wirelessly or with Bluetooth to the piano which could display all internal controls and features on an app so that you could access all functions that way. There still is no top name digital piano that can do that yet although some of them are trying and do have a few features accessible with an app for iPad/Android use, but it is all still quite basic yet. The GP's are designed primarily for a person to play piano with a few other extra features added along with some basic but good instrument sounds, MIDI & audio recording, and some editing features, so the display screen & navigation is generally satisfactory for those purposes. The feature set and sound library in the GP500 & 400 pianos include 35 instrument sounds (the GP300 has 28 sounds) which include acoustic pianos, strings, choirs, organs, harpsichords, etc. Theses sounds can be layered 2 at a time, split with 2 different instruments one on the left side and one on the right side, duet piano mode for 2-person simultaneous play, registration preset "scene" mode for saving your own setups or using preset factory setups for instant play, lots of different hall/reverb settings which really adds to the realism of the piano sound along with adjustable touch sensitivity, brilliance, and DSP which helps the user/player create a customizable piano sound and action response. There are a number of specific organic piano sound elements which Casio/Bechstein incorporates into the GP500 & GP400 which allows the piano sounds to be even more natural and organic. This feature is called the "Acoustic Simulator" and would include things like adjustable Hammer Response, Damper Resonance, String Resonance, Aliquot Resonance (this feature is found in fine grand pianos and adds to the harmonic richness of the piano sound), Open String Resonance, Lid Simulator, Key Off Simulator, Damper Noise, Key On Action Noise, and Key Off Action Noise all of which are adjustable so that you can micro -customize the piano tones the way it would sound best to you. The GP's also have a variety of tuning temperaments as well as a variety of piano stretch tunings including being able to shut off the stretch tuning depending on what sounds best to you. But for many people the factory default preset acoustic piano sounds may likely be enough to give you an outstanding piano playing experience. When it comes to adding some "fun" to this model, Casio has a new feature called "Concert Play" which means that you can select from up to 15 songs that are full orchestral CD quality renditions of famous classical music that you can listen to and play along with. You can even slow down the concert song while you try to learn it as well as rewind, fast forward, and loop a set of measures together for repeat play. You can also download new Concert Play songs from a Casio internet site, save them on a USB flashdrive, and then play them on the Grand Hybrid's. The Concert Play songs sound absolutely authentic just like listening to a full, live orchestra right in your home coming through the internal piano speakers. You can also play MIDI piano performances along with education piano song lessons by downloading those files on the internet and saving them to a USB flashdrive for playback on the piano. Speaking of speakers, the internal speaker system is unique in that the top of the piano has a movable lid which can be propped up to allow more sound to come out towards the player which gives you the feeling of a grand piano sound experience with the lid open. You can even see the hammers move by looking through the inside top of the piano while you or someone else is playing. The only other digital piano that has a lid that opens in this general price range is the Roland LX17 but that piano retails for $1000 more at $6999 and has no moving hammers like the Grand Hybrid's. These new pianos have 6 speakers, 4 amplifiers, and 100 watts of power each which is actually plenty for these models, but they pull only 38 watts of power from your electricity, so the amplifiers are fairly energy efficient. 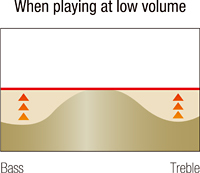 The 2 main, larger speakers of the piano are housed in separate acoustic boxes mounted underneath the piano with the speakers facing downward rather than forward as on some other digital pianos, so that the GP piano sound is coming both towards the player on the top and the bigger speakers towards the floor like a grand piano soundboard would do. In my opinion this makes for a more natural piano sound experience and I did like it very much. The piano also has 2 headphone jacks for private play along with USB output to device for iPad and computer connectivity and USB flashdrive input for song play and recording, and also two regular MIDI connectors for those people who have MIDI music gear that they want to connect to the piano. Casio included 1/4" input and output audio jacks for connecting external devices to enhance the piano sound even further through external speakers or use the internal speaker system to amplify other sound devices such as computers, tablets, MP3 players, etc. There are other functions and features on the GP500, GP400, and GP300 but those are secondary things as compared with what I believe it this digital piano's primary purpose and goal...to offer an impressive grand piano playing experience in a beautiful polished ebony cabinet with folding key cover, full size music rack, opening lid and matching bench along with a complete 5 year factory warranty on manufacturer defects if they should ever occur. The GP500 is only available in polished ebony finish, so if you want a non-polished ebony coloe, the GP300 & GP400 come in satin black. Based on what I have seen for many years on all of the other digital pianos that Casio has produced and the overall quality and "bang for the buck" they have brought to the table, I believe Casio has a great future in this premium category for higher priced digital pianos with the advent of their new Grand Hybrid series in cooperation with the Bechstein Piano Company. For some people the Casio name has a negative connotation because over the years people have wrongly equated the Casio name with low price and low expectations simply because Casio has focused on the lower price range with many of its electronic products. But nothing could really be further from the truth as in reality all that means is that they offer a lot of product and features for less money than you would otherwise expect and the same seems to be true for the GP300, GP400, and GP500 pianos. Casio has not, in the past, had the prestige or gravitas of a digital piano name like Yamaha, Kawai, or Roland. I know that, they know that, and many shoppers know that. But a name means less these days considering how much great technology is being developed by companies who were not as well known before with having higher priced technology products, such as these Grand Hybrid pianos. There are many examples of these kinds of consumer electronics companies in the computer, cell phone, and TV industries, and even though Casio is very well known in the lower priced digital piano keyboard world, they are definitely not known for having digital pianos which compete with the highest price Kawai, Yamaha, or Roland digital pianos...but now they do. With the help of the Bechstein acoustic piano company along with new piano sound technology developed by Casio, I believe this is just the beginning of their successful partnership and they should be able to continue to develop even more impressive digital pianos in the future. I would not be surprised if they came out with a mini-grand piano shaped product in the future as that would be a logical next step for these two companies working together. But for now in my opinion the GP series certainly is up there with the best digital upright style pianos that Yamaha, Kawai, and Roland have to offer in this price range, and in fact the GP400 & GP500 is even more realistic than the competition in a few different ways, as I have already talked about, such as its special all-sprucewood European hammer action key movement and tonal dynamic range of expressiveness. As for the other Casio-Bechstein models like the GP300 ($3999US retail price), the piano sound is not quite as realistic as the GP500 although it is still very competitive with other digital pianos in its price range. In addition to this, Casio is just coming out with the new GP400 which has the same features of the GP500 but with a new cabinet design available in a lower priced satin black simulated woodgrain finish priced at $4999US retail. After putting the GP's through their paces, I agree that these models would make an excellent addition to anyone's home, church, school, or studio as long as they understand that the Grand Hybrid digital pianos are primarily designed to be purchased in place of an acoustic grand piano and are not heavy on additional features such as wireless, Bluetooth, lots of extra instrument sounds, has no drum patterns, no automatic interactive chords, no General MIDI recording or playback, no multitrack sequencer, and no proprietary iPad apps like some other digital pianos do. However, with USB to device connectivity you can plug in a USB cable and use many MIDI iPad apps with full MIDI/USB interaction from a Grand Hybrid to the iPad along with Bluetooth audio connectivity using a 3rd party Bluetooth adapter plugged into the piano audio input so that music from your iPad/Android device can stream directly through the GP500 speaker system. Also, it has been my experience that direct connectivity using a USB cable is more stable than with internal Bluetooth or WiFi connectivity. As far as I am concerned, at 170 lbs in weight with cabinet dimensions of approximately 56" x 19"x 38", the very attractive polished ebony GP500 is a piano I would definitely own if I wanted to focus squarely on the best possible grand piano playing experience that Casio-Bechstein has to offer along with being a more minimalistic looking instrument which adds to the overall elegance of this piano. 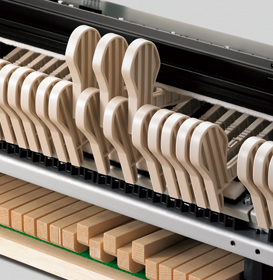 The Bechstein key action hammer system is not available in any brand of digital piano and you won't get a moving grand piano hammer mechanism until you get to the Yamaha Avantgrand N1 which has a retail price of $9999US. The appearance of the GP500 is also impressive in that when you prop open the lid of the piano to let the sound come out more, you see an attractive red material covering the inside piano top and you can actually see the moving piano hammers through two long rectangular windows in the top of the piano while you are playing the keys. It's a very cool visual experience along with having a beautiful piece of furniture. The GP300 and GP400 have this feature as well. There is one thing I find to be a bit odd when it comes to the GP500 and that is the height adjustable black bench included with the piano does not match the high gloss black piano finish. The bench is a single size satin black (non-gloss) finish and even though an adjustable height bench is very nice to have, I am a bit baffled by the lack of a matching high gloss finish on the bench. Is this an oversight on the part of Casio or what? I just don't understand the reason for this but it's something which can be easily corrected if Casio chooses to do that which I recommend that they do. The satin black bench is fine for their satin black pianos, but not for the polished ebony finishes in my opinion. It's also important to note that some very nice high gloss polished ebony benches are available on-line at Amazon.com for low prices anywhere from about $50-$75, and some of those benches look to be as nice or nicer than the Casio bench included with the GP500. So the bench is a solvable problem and the extra cost for a polished ebony bench is a small price to pay, but it still should not be the responsibility of the owner to do that in my opinion. The bench issue is definitely not a deal breaker and is a very small thing as compared with all of the great things this piano can do. Another thing I noticed about these pianos is that when you plug in headphones, the output volume of the headphone jack is a bit weak, at least it is for my ears. For many people it will be just fine, but for others, like me, I like the piano volume in my ears to be louder when I want it to be and the maximum headphone volume could be better. Along the same lines, the maximum volume output through the internal speakers could also be a bit louder just like in the headphones, I prefer to get a big volume because I like to be able to play loud when I want to and the GP series could be better in this way in my opinion. Since the GP500 costs more money than the other GP models, I was hoping that the GP500 speaker system would also have an upgraded internal sound system, but it is identical to the lower priced GP models. I would prefer to spend a bit more money on the GP500 to get a more powerful internal sound system, but for many people it will be more than adequate the way it is. Based on my personal experience I am pretty sure that the $6000US retail price of the GP500 and the retail prices of the other two models will be discounted a bit in US piano stores that carry this model as most stores do discount their piano prices. The GP pianos cannot be purchased on-line from a US shopping cart piano dealer, and the Hybrid Grand models are not yet available everywhere in the US at local dealers, so you may have a difficult time finding one at this point. However it is definitely worth the effort and if you want more info on where these models are located or what their competitive pricing would be, please email me and I can give you more info and advice. This is Casio's first attempt to enter this premium digital piano category and I am sure we will see even more models come out in the future having their continued partnership with Bechstein piano company of Germany. As for the the lower priced satin black GP300 and GP400 models, if the GP500 seems to be out of your price range and/or you want a satin black finish, then you should consider those lower priced Grand Hybrid pianos instead of the GP500. You can still be quite happy with the GP300 and GP400 and they stacks up extremely well against their competition. Be aware that the new GP400 probably won't be available at stores until near end of August. Below is a comparison chart of the 3 models so that you can visually see and know the primary differences among them. 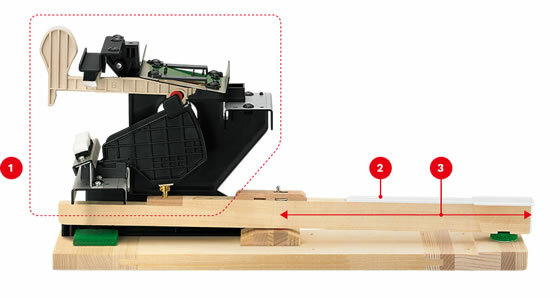 2 x 6.3"+ 2 x 4" + 2 x 2"
57" x 19" x 38"
58" x 19" x 39.5"
*Please take a look at the video below of the Casio - Bechstein Hammer Action movement and watch how the moving hammers behave like a real Grand Piano. No other digital piano brand in this price range has anything like it. To me that's pretty impressive.